It's hard to believe January is already over and February is here. Valentine's Day is coming soon! I don't get as many requests for homemade Valentines now that the kids are getting older. However, they still enjoy the Valentine's Day treats I make them. So far, I've only made some cookies (and froze them), so I'm still trying to come up with more ideas. If you want any ideas, I have a list of Valentines, Food, Crafts, Gift, and Activity ideas below. If I come up with any new ones, I'll update the list! Candied Popcorn Bags, "I'm popping with happiness that you're my Valentine". One year I attached a Valentine themed bag full of candied popcorn to a store bought Valentine. Hot Air Balloon: it could even have a picture of your child in the basket. "Your friendship lifts me up." Bubbles with a Valentine's Day themed note like "Your friendship makes me bubbly". S'more Kit (marshmallow, graham cracker squares, piece of chocolate), "Your friendship makes me feel mushy inside". Goldfish or gummy fish in a fishbowl shaped baggie with a "school" type of message. The bags can be hard to find and a little time consuming to make (click for directions), so you can cut a bowl shape piece of paper, write the message and place behind the fish. Other non-candy ideas: clementines, cars, glow sticks/bracelets/necklaces ("Your friendship brightens my day"). The dollar store or dollar bins at Target or Michael's are great to find little treasures in. Hanging Stained Glass Card with "stained glass" made from wax paper and crayons. Easy Stained Glass Heart with contact paper and tissue paper. "I know I'll go far/succeed with you as my friend" type of message with a goodie bag of school gear: pencils, erasers, goldfish bag, ruler, markers, stickers, etc. The dollar store or dollar bins at Target or Michael's are great to find themed pencils and erasers. The Sky Is Falling, using heart shapes. Hidden Surprise Poundcake. I made this for St. Patrick's Day, but if you substitute a heart for the clover, it would be great for Valentine's Day! Candied Popcorn. Place in little Valentine's Day themed bags and they make a great Valentine's Day treat! 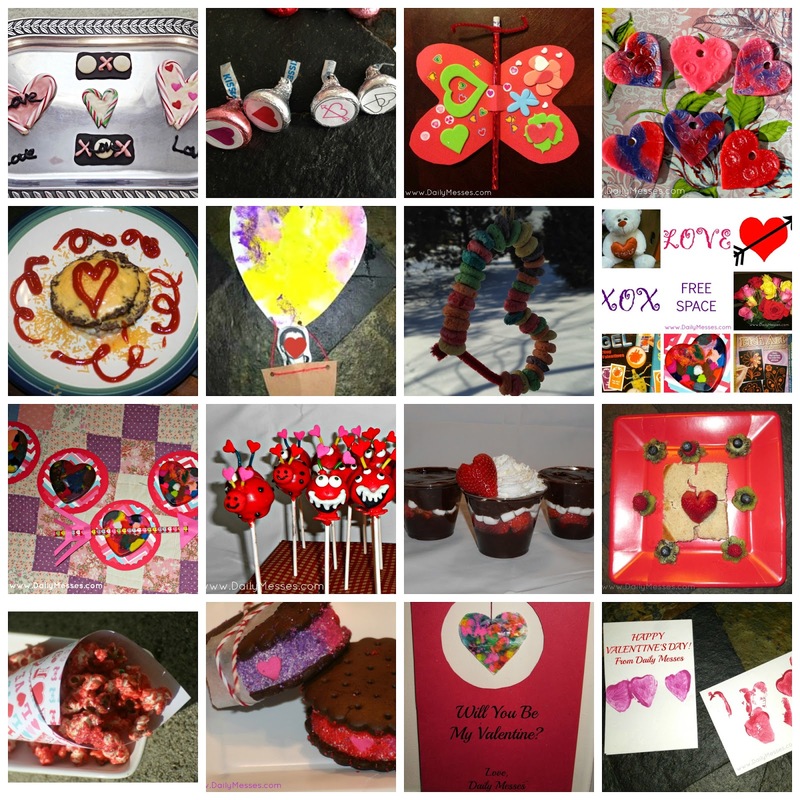 What are some of your favorite homemade Valentines and treats?